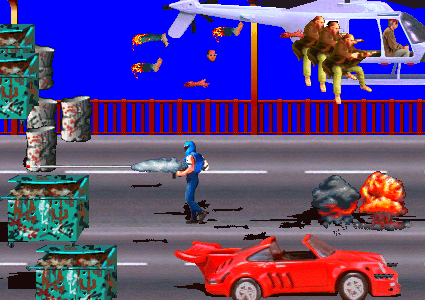 In 1988, Midway released NARC, a side-scrolling arcade shooter in which players waged a literal war on drugs. And prostitution. And dumpsters. While it’s admirable that someone finally had the guts to craft a revenge fantasy against the armies of jean-jacketed PCP addicts and perverted clowns that once terrorized the streets of America, Midway’s fascination with extreme violence undercut the anti-drug message a bit. Though arresting drug dealers is presented as an option, NARC makes it explicitly clear that the preferred solution is to explode them with rockets and let their severed limbs rain from the skies like confetti in a Fourth of July gore parade. Also worth mentioning is the background music that plays during NARC’s second level. It’s not a vocal track…or at least, it wasn’t, until it was covered and released as a B-side by the goddamned Pixies. Lyrics are here, if you’re having trouble deciphering them. This entry was posted on Monday, July 4th, 2011 at 1:27 pm and is filed under Arcade, Video Game Vocal Trax. You can follow any responses to this entry through the RSS 2.0 feed. You can leave a response, or trackback from your own site. I actually completely unironically like original NARC. It’s a fun gory shoot’em up with lot of enemies and stuff happening, and with two players on one machine makes an excellent entertainment, together with hamfisted “say-no” message. From a pure score perspective, I think arresting the criminals is actually the best option. But many of the game’s deadly drug fiends cannot be arrested, so it becomes moot after the first few stages. I love NARC- it’s delightfully over-the-top. If being a narc was anything like the game, I would have contacted my local DEA recruiter years ago. I rented the NES version from a Movietime Video (or one of the other pre-Blockbuster-dominance video chains), and my mother actually ripped the game out of the console and brought it back to the store. I guess she didn’t like the flying limbs after giving someone a bazooka shot to the head. This is one of those arcade games I never got to see the end of until emulation. The most infuriating thing about NARC is the final battle with Mr. Big – using a continue starts the fight over from the beginning, and it’s nearly impossible to beat him unless you go into the fight with a lot of rockets. Since you have no way to pick up extra rockets after continuing, you’ll be practically throwing your tokens away and dying to him over and over with no choice but to start over from the beginning. I mean, I’m sure technically it’s POSSIBLE but I still can’t figure out how to do it without jumping and firing lots of rockets and hoping for the best. It’s hard to be precise when you fire regular shots from a jump.